When it comes to your web site’s effectiveness, one of the obvious questions to ask is: Why don’t more of your website visitors make an enquiry? As you know from hard-won experience your prospects are very unlikely to pick up the telephone and call you when they are viewing your website. And even fewer will use the ‘contact us’ form on your site! Think for a minute how many visitors or hits your website has had since it was launched. Perhaps 5,000, 70,000, 250,000 or maybe more. The vast majority of them haven’t found you by accident; they are actively searching for a solution to a problem which makes them serious potential buyers. Now tell me how many of these pre-qualified prospects have you captured details from, and are regularly marketing to? Now if you were to have a means of capturing their names and email addresses before they left your site, you would soon possess a priceless database full of eager prospects. But How Do You Get Their Details? Well, remember these visitors are doing their research and they’re looking for answers and helpful information. So package-up your valuable knowledge and experience to create a regular bulletin or special report or white paper. Now promote this critical information on your homepage (or via a pay-per-click advertisement), with the aim of helping your prospects do their research better. Free content can include mp3 downloads, PDF or printed reports and white papers, buyers checklists, spreadsheets, software downloads, case studies, videos, recorded interviews, webinars, free products etc. etc. 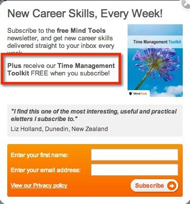 This free offer needs to be so attractive that it will tempt your prospect to part with their email address. This is why these compelling resources are often known as a ‘lead magnets’. Lead Magnet – noun – an irresistible bribe offering a specific chunk of value to a prospect in exchange for their contact information. A good lead magnet needs to simply solve a specific problem with a specific solution for a specific segment of your market. So What Makes a Good Lead-Magnet? It has to be something your prospects really want, something that is genuinely useful such as a guide that helps them to solve a problem, or a cheat-sheet that is a useful resource, or a free tool that they can use right away. It has to be related to your business. If you are selling pension advice, there’s no point in giving away a free children’s poster. If you give away a resource that educates prospects on the options open to them with their retirement fund, you’ll get prospects with an interest in this specific area requesting the information. Keep it short. An offer you can quickly benefit from is far more attractive than a much more substantial offer that takes hours to work your way through. Given the choice between watching a 3-minute video that demonstrates the benefits of XYZ or download a one-hour video on the same subject, most of us would be happier to opt for the shorter version – initially. The main aim of your lead-magnet is to get the right people to give you their contact details, so it’s best to make your offer free. One exception is obviously is if you’re offering a discount. Lead magnets are not new so it is important to make yours different and original. • Reports – Do you possess some really good research about your product or industry recently? Do you have valuable insights, market intelligence or knowledge that you can offer prospects? Here’s an example of a successful report offer we used last year. 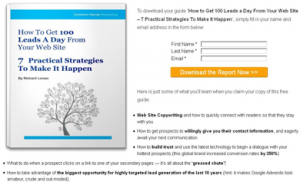 • eBooks – PDF guides that give helpful advice to prospects. Here are some examples, which have been written and are being offered by three very different Companies. • Free webinar or videos – An interview, webinar or someone talking to camera. 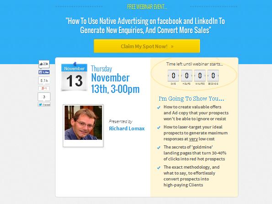 Here’s an example of a webinar we offered about advertising on Facebook and LinkedIn. In order to claim their spot prospects needed to enter their name and email. 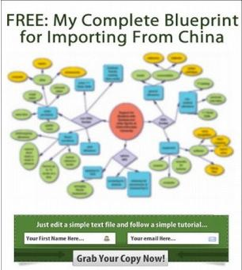 • Cheat sheets/handout – They are generally very short (one or two pages) and cut straight to a specific point. These can be delivered as checklists, mind maps or blueprints. This mind map is blurred out to build curiosity. • Template – Is there a letter or document your prospect needs to write? Offer a best practice example with guidance. • Special offers – This is a very popular lead magnet. 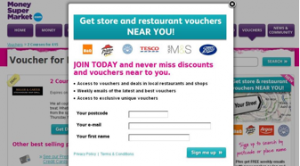 Can include discounts, savings, and bonuses. 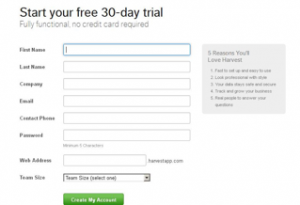 • Free trials – Let your website visitors sample what you offer for free, for a limited time. This example is from www.getharvest.com who sells time tracking systems. • Quizzes – People love to assess their skills or knowledge. It sounds obvious but the quiz needs to be relevant to your core business (e.g. for an aspiring chef, ‘Test your knowledge on culinary herbs with these 22 questions’). Their result can be sent to them in exchange for their email. There are quiz building tools such as Interact to help you create these quizzes. • Assessment/Test – An assessment or test, particularly if it is delivered online can make a powerful Lead Magnet. We offered a 20 point website benchmark assessment which was very popular. • Sales Material – In some cases, the most desired piece of information for the market is pricing and descriptions of products or services. 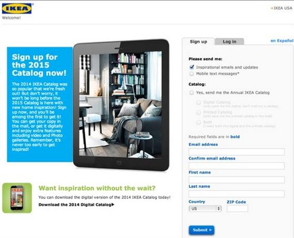 Ikea collects contact information in exchange for their catalog which they then deliver digitally. I hope you can see that with a little though and effort, you too can create a compelling lead Magnet, that will tempt your ideal prospects to give you their name and email address, so that you can continue to help them find the best solution to their problem, or the best supplier of whatever is is they are looking to purchase. If you’re stuck for ideas, send me some details of your business below, and I’ll give you some examples to get your mind working! I am looking to concentrate more on portraiture, mainly studio based. Any ideas/suggestions will be more than helpful. Hi Ron, to encourage prospects to make contact with you, they need to believe that you are the best person to take their photographs. So consider offering a free guide along the lines of ‘The 5 key Secrets To Creating Memorable Family Photographs/Portraits’ or ‘How To Shoot The Best Photographic Portrait – 3 Key Steps Explained’ or ‘Why Some Family Photographs Disappoint, Whilst Others Capture Magical Memories’ or ‘How To Choose The Best Portrait Photographer – 5 Important Questions To Ask’. I hope that gives you some ideas to work from! 21 copywriting tips from Clayton Makepeace. Part 3. 21 copywriting tips from Clayton Makepeace – Part 2.